Ever wonder for the exact purpose of a digital temperature controller? Or what is the best devices for your use case. 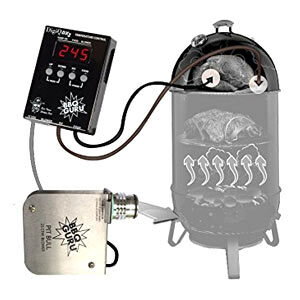 Do you think about home brewing, terrariums, aquariums, barbecue, and DIY projects, and how to build a digital temp controlling system for them. Then we will show you the right unit. Temperature controllers are used for many different household and industrial applications. Read our review article and find out more about these electronic devices. The bellow table will give you synthesized info about the models reviewed in this article. Their most important features and up to date price. If you decide that you need more information before buying your system, scroll down to our review section. What Is a Temp Controller? A digital temperature controller is a electronic control system used for holding a stable temperature ranges over time. The controller works by reading the input temperature with the help of a sensor (thermocouple or resistive thermal devices) and then compare it to levels set by the user (setpoint). Then depending on the result, the controller sends output signal to a control element usually connected to the outlet socket thermostat. The control element acts upon a signal and applies heat or cold to maintain the setpoint. Fans and heaters are usually used as a control element. So what are the best devices for controlling the temperature. Read our review article and find out about 8 of the most used units organized by use case. Conventional temperature controllers provide the ideal control capabilities for industrial, laboratory and cooling procedures. These will often come with sensors that can determine precise temperature levels. Some of the common industrial uses include various applications such as thermoforming machines, food processing devices, packaging equipment and even for food production activities as well. Hobby or home uses include aquariums, grills and terrariums. They may also be used for hatching eggs among various other tasks. Many DIY enthusiasts use control units to build interesting automations systems to control various machines. People doing home brew is often using control devices to maintain steady fermentation temperatures. This is perhaps one of the more prevalent brands that are available today. Waltow provides various types of temperature control units. These devices are reliable tools that operate based on single and multiple cycles of control. Some of their main devices come with open loop break detection features along with excellent alert features and controls. More so, they also produce both analog and `smart` digital temperature controllers. Johnson temperature controllers are popular solution as they provide various design features and simple installation results. Johnson temperature controllers do not require additional wiring as they guarantee the ideal plug and play results, especially for novice users. These products are classified into two categories including the analog and automatic options. Both these tools are operated by turning the kegerator on and off through the use of a special four-degree angle swing. As a result, this unit will automatically turn off when it reaches the four-degree angle. This company’s models feature unique electric plugs which necessitates users to have general skills when it comes to wiring and installation. The added benefit is that these units provide a better range of operation with some units operating in temperatures that average from between -30 to 220 degrees Fahrenheit. These models are perfect for brewing purposes rather than for cooling applications. More so, most of these units come with digital readouts and push button controls for added functionality. The price that you would have to spend on your controller is largely independent on the functionalities that you expect from your chosen digital temperature controller. For instance, the higher end models will have relatively higher price tags than the conventional models you may spot. These tools will still provide users with top quality temperature control features. Before choosing the best temperature controller for your needs, ensure that you evaluate the functionalities of the unit in relation to the price tag. In this way, you can invest in a unit that provides the best value for your investment. This refers to special types of controllers that allow for proportional, integral and derivative functions, otherwise referred to as PID. This controller uses the benefits of proportional control along with two supplementary features to ensure that the unit can automatically repair any inconsistencies in the temperature measures. In most cases, these adjustments are often represented as derivative and integral time-based metrics. The PID must be specifically customized to suit the functionalities of a particular system by using techniques such as trial and error. These systems provide precise and stable control features and are a common occurrence in systems that have relatively small masses. You want to use a digital temperature controller that can accommodate a broad spectrum of temperature inputs and leverage auto-tuning features to provide users with the best temperature results. For instance, a good temperature control comes with a PID control with soak capabilities and a ramp to maintain the temperature levels exactly where you need them to be. More so, some of the higher end temperature controllers come with on/off relay controllers or additional accuracy performance settings for users to handle with ease. Most of the digital temperature controllers that you’ll spot provide you with ideal power ratings. This often refers to the capability of the unit when measuring temperature and its ability to withstand adversities such as power surges as well. Some of the higher end units can provide as much as 1200 watts of power. Home wine and beer making is one of the most common use for these type of digital units. Maintaining accurate temperature is one of the most valuable things you can do to ensure good fermentation for quality product. That’s why brewers use freezer (keezers), kegerators or heat wraps to cool or heat the environment. But to be right on spot with the temperature you will need the controller to regulate their power. 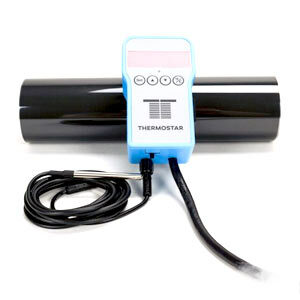 Thermostar is a perfect for monitoring fermentation temps and provide precise control of your kegerator or keezer. It comes with an excellent dual mode digital controller that can work from -50 to 300 degrees Fahrenheit. This thermostat unit features a responsive dual color LED Display. It also comes with a modular probe that reduces the need for a thermowell. It is responsive and easy to utilize. The lower profile design features several mounting features. It can fit well onto many tanks. This unit has been tested for optimal performance by brewmasters. It has been inspected to be easy to handle and is very reliable. Thermostar work with a variety of tanks and surfaces. It works well with fermentation chamber or can be used directly with the fermenting vessel. It has a clearly visible display screen that is very easy to use. The control setup is simple and it is not complicated. The modular probe is also easy to grip onto. You will appreciate the low profile design that comes with several mounting features for added user convenience. The 12 inches stainless steel probe is perfect if you want to measure your fermenting liquid directly. Thermostar comes with both heating and cooling mode. This digital temperature controller takes to time to customize to suit your temperature measurement needs. Besides that, the probes are prone to damage, and you need to proceed with caution since you can damage them. The default probe is kind of short and you have to get a longer 12-inch model sold separately. The aquarium controller is a useful device whose main purpose is to extend your heater. He can monitor aquarium water condition and put the heater in ON/OFF state. The device is 100% sure to increase the efficiency of your fish tank heating system. It comes with a prewired heating output temperature controller with outlet socket. The connections used are organized properly and with ease. This unit lets users customize the features to two different temperatures by using a dual time cycle. The two options are organized digitally and are easy to display. It works well for overheating purposes and can be perfect for the physiological needs of animals and plants. It responds fast and without problems. 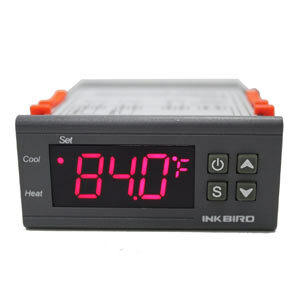 The Inkbird Digital Outlet heat controller produces 1200W of power. It works with temperatures from -58 to 210 Fahrenheit. 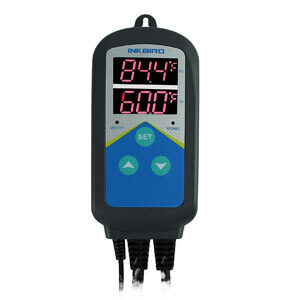 The Inkbird Outlet Heat temperature controller comes with several different features that make it perfect for aquarium heating. It comes with a prewired heating output temperature controller and a time function. Another excellent feature is the dual time cycle setting that works throughout the entire day. As a result, this unit becomes perfect for the physiological needs of plants and animals. This unit can be used in various systems that require overheating protection and automatic temperature control features. And, with its large power output of 1200W, I can use it for seed germination, aquarium and even egg hatching needs. This LED panel on this unit is sometimes difficult to navigate, especially in poorly lit conditions. Additional light source is sometimes required to improve the visibility levels when sensing the temperature. The power cables are kind of short too. The output cable is only a foot long. The key to a great BBQ is to maintain the temperature even the whole time during cooking. Many people think maintaining consistent conditions while cooking on a charcoal is a daunting task. To get rid of this problem and make the perfect BBQ you will need and special setup to control your cooker or smoker. The device is simple in nature but very useful – the controller receives the conditions inside the cooker; when the temperature is below the setpoint a thermostat turns on; and a fan connected to it puts an air to the charcoal, increasing the heat. DigiQ BBQ will maintain the temperature so you don’t have to worry about adjusting it by hand. This is a perfect device to maintain low and even temperature trough the entire cooking process. This unit helps to manage unstable temperature swings. It is designed with cookers in mind to review how quickly temperatures can change and is easy to manage without problems. The high precision digital food thermometer observes the temperature of your food with an audible alert system. It lets you know when the food reaches a certain temperature level. It can be quickly hooked up to your cooker. You can set the cooker temperature and then get more control out of the setup. This fits on Weber grills and smokers. It may work with other models as well. The DigiQ BBQ temperature controller comes with a high precision digital food thermometer that is perfect for regulating unstable food temperatures. It operates for hours at a time so the temperature can be consistent enough to prepare meat well enough. It goes down to 180 degrees Fahrenheit and is easy to adjust in other ways. It is very easy to follow and use. DigiQ has simple to set up design construction that lets you set your cooker temperature like a breeze. Some user report that the unit provides accurate temp results that are similar to that of an oven-like temperature. With this DigiQ barbeque unit you will achieve consistent cooking result. The probes on this unit are susceptible to damage and you should use them with caution. More so, I also found that the manufacturers should have done better at indicating the functionality of the unit to allow for ease of navigation. Also, this does not fit onto all smokers or grills. The company behind this does make models that work with a variety of other grills in mind. An important part about setting up your terrarium is making sure it is hot enough for your plants. This can be determined by where you put it inside of your house and also by using external types of heat. An important thing when owing a terrarium or vivarium (reptiles) is the look for the temperature to not drop to mutch below room temperature. That’s why an important thing to have is some sort of measuring/controlling device to measure and manage the warmth with the help of adhesive heater (heat mat). One such great gadget is the main focus of our article – the controller. iPower is perfect for situations when you don’t want to overheat you under tank heating pad. It is designed to turnoff your heating pad when it reaches certain temperature. This is done by plugging your pad directly in the thermostat and lowering down the probe inside the tank just above the pad – where the host spot is. And you are good to go. This unit guarantees consistent temperature results for vivariums and terrariums. It guarantees an easy to plug in operation (outlet) with an illuminated indicator and LED support. The power is ground well enough to create a comfortable design that isn’t too hard to use. This unit provides excellent temperature control range of 68-108 degrees Fahrenheit. It monitors how well growing areas are handled. A sensor can be placed into a rooting area about one to one and a half inches in depth. It can easily go into a surface and is easy to remove when necessary. There are several features that quite good in this unit including that it provides consistent temperature control results for various applications including the terrarium and even for the aquarium. Furthermore, this unit also comes with a compact design that makes it perfect for temperature control applications in small tanks. With the inclusion of the illuminated LED indicators it very simple to determine the current status of the unit. Furthermore, users will also appreciate the perfect temperature control range that averages at 68-108 degrees, which makes it perfect for most demands. One of the main drawbacks of this temperature control unit is that it tends to be difficult to program at first. As a result, it is not a good tool for novice users. It may take time for the rolled up heat mat to flatten out sufficiently for temperature control functions. It doesn’t work in all types of habitats as it does much better in smaller areas where it might be a little easier to handle controls at a given time. Also, this can be damaged when it is exposed to water. This digital temperature controller features a compressor delay protection time setting. It creates a better control solution as needed. It also comes with high and low-temperature alarms in the system. It identifies when the temperature changes substantially. 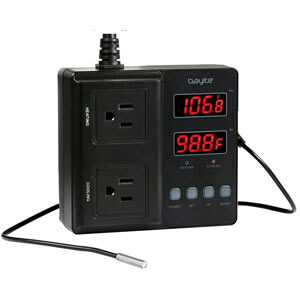 When it comes to this particular digital temperature controller, the feature you may appreciated the most is the unique plug and play design that allows for simple installation. Furthermore, you may noticed that the high and low-temperature alarms are perfect for alerting users when perhaps the temperature exceeds the excepted range. The inclusion of the auto shut off timer means that this unit is convenient and it makes for the perfect addition for users who are forgetful about how temperatures work. In this way, I found that this feature helps me to save on energy and the longevity of my digital temperature controller. More so, this unit also provides both Celsius and Fahrenheit reading to make it dynamic for various functionalities. For the design features that this unit comes with, it is rather expensive than other similar units that are available on the market today. Besides that, it sometimes provides inaccurate temperature reading and you might have to compensate to achieve the correct readings manually. If you want to tinker with temperature controll in your next DIY project, the following devices may be perfect for you. They are compact, customizable and compliant with every industry standard. You can use them to make a custom devices similar to the pre built models above – home brewing system, aquariums, lizard tanks or anything of that sort. You can make device with both heating and cooling functionality. The difference with the previous units is that you need some knowledge on how electricity works and how to wire electronics. The thermocouple refers to a special electrical device that comprises of two different conductors that form electrical intersections when measuring varying temperatures. In most cases, the thermocouple can produce voltage that is dependent on temperature, which is based on a thermoelectric effect. This allows the voltage to be measured and the controller to act upon the result. That’s why the thermocouple is perfect for temperature sensing needs. Some of the higher end thermocouples tend to be affordable, customizable and even supplied with the conventional connectors that can measure various temperatures. On the contrary, to the conventional methods of temperature measurements, the thermocouples don’t require supplementary power. The large and well-positioned LED feature displays how well heating and cooling functions work in real time. It improves upon how I can adjust the settings. The small temperature controller comes with a large measuring range. It works from -58 to 194 degrees Fahrenheit. The temperature calibration and delay protection function helps with keeping the setup for managing temperatures in check. Dynamic functionalities make it perfect for water tanks, refrigerators, boilers and even steamers. 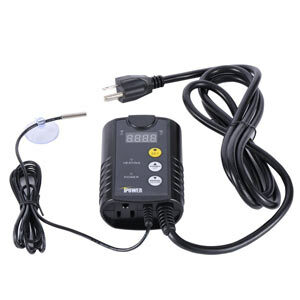 The Docooler Digital Temperature Controller is perfect since it comes with various design features. For instance, this unit features an ample sized and well-positioned LED that makes it perfect for customization needs. It is very small and compact controller with ample sized measuring range that makes it perfect for various DIY projects. It can be used with refrigerators, steamers and even boilers. One disadvantage of this unit is that it tends to overheat after an extensive duration of use. As a result, users might have to regularly switch this unit off to avoid causing extensive damage to the internal components and to guarantee long-term performance. It also uses only one relay output, thus meaning that I have to handling only heating or cooling at once. I cannot use both at the same time. A proportional integral derivative controller refers to a control loop feedback tool that is commonly used for industrial as well as household applications. These tools can be used to calculate the error metrics as a difference in between the chosen setpoint and pre determined variable. This predetermined value will help to apply a correction value based on the PID. The PID control collects data and asses it to give the exact output value needed to control the temperature. It is quite different than the regular ON/OFF control. This controller combines proportional control with two additional adjustments, which helps the unit automatically compensate for changes in the system. Digital controllers that are equipped with PID capability can give optimal thermal system performance using the auto tuning algorithms. It comes with a dual digital display unit that is programmable. The readout is easy to look at with its large indicators. This unit supports various types of thermocouple sensors. It even uses two lines for output reviews. Three build auto tuning time proportion algorithms are designed to see how easy it is to make it work. Individual controls and setups can be handled with ease. Dynamic powering options help with keeping it working at a strong range. It works from -1999 to 9999 depending on the input signal being used. There are many appealing features on this digital temperature controller. 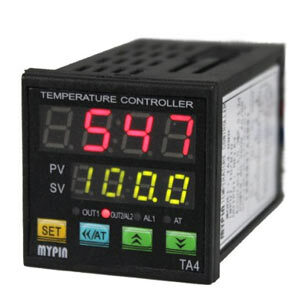 For instance – the dual display digital controller design that can handle various types of thermocouple sensors; The dynamic powering options including the AC/DC connection and a good consumption level of five volts. The unit also comes with three built in auto tuning time proportion algorithms that let the user select the best application or environments that need to be controlled. It comes with a unique SSR control feature that makes it perfect for connecting to Solid state relays, which can withstand a large amount of current in one sitting. The one key operation and simple to use design makes it an excellent candidate of your next DIY project. The unit can be rather heavy and the manufacturers should have done something to reduce the overall weight of the unit. This one is one of the most used controllers on the market. It is used by thousand of DIY enthusiast around the world. 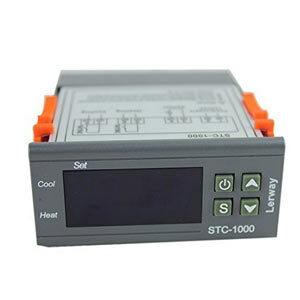 The STC-1000 turns ON or OF depending on the temperature, it is all it does and does it very well. With the help of additional 12 inches stainless steel probe this is the perfect controller for any application. When you plunged in and it starts working it is just a pleasure to use. The temperature customization or refrigeration control delay protection feature helps with analyzing how well temperatures are being managed at a given time. It especially works well at temperatures from -50 to 99 Celsius. It comes with an auto switch feature that moves the unit between heating and refrigerating. It assists in getting the switching setup under control with ease. Users can set the control temperature by customizing the set point and different value that may be required. This improves upon how efficient the unit is in any special case. An alarm rings when the temperature surpasses the normal level or when the sensor malfunctions. It operates in many humidity levels. It works in spots from 20 to 85 percent humidity. The Lerway 110v Digital temperature controller also had various excellent settings to make it perfect for many DIY projects. For instance it comes with an efficient temperature adjustment or refrigeration control delay protection feature, to make it the perfect addition even for novice users; It features an auto-switch mechanism, such that users never have to worry about manually changing the settings. The user can customize the perfect control temperature by inputting the setpoint and different value as well. The Lerway 110v comes with an alarm that alerts the user when the temperature surpasses the normal average level. This digital temperature controller can be a bit complex to set up. While it may provide excellent digital control temperature control features, it is a great challenge for the users to customize this unit to suit their needs. While all of these digital temperature controllers are effective and useful, the ThermoStar Digital looks easier to use. It was very responsive and set up was a breez. The unit can work with an extensive cable with the option to use a longer one for readouts. The low-profile design is especially great for how it easily handles different types of controls and setups. It is all purpose tool that will serve you well for years.